Some five years ago I wrote a post with a similar title and extolled the virtues of producing content strategically and in multiple formats. Much about content has continued to evolve in the time since I started writing about it. Entire books have been dedicated to the specific topic, many tools and services have cropped up to support the need to create content and, generally speaking, most marketers have come to accept and expect content production as a necessary tool to drive awareness, interest and conversion. What I see as the next evolution of the concept is a move to a more active state of what we consider to be content. In other words, content in the context of marketing is now a verb. Instead of using the term only to describe the act of producing words, pixels and frames, I believe it is now time to talk about content in the all-encompassing manner in which we actually use it. 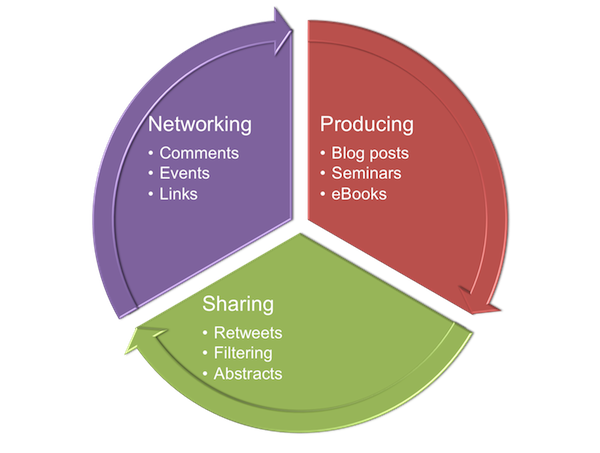 Today when I talk to clients and audiences about the need for content I am referring to the act of simultaneously producing, sharing and networking as a form of an active cycle of content that has entered every aspect of what we do as marketers. The effectiveness of your marketing efforts depends on seeing these three things as one-act and adopting this mindset as you plan and carry out your editorial activities. So, you see that blog post you planned, researched and typed into WordPress isn’t fully alive until you amplify it, share at least four or five related blog posts written by others and debated the merits of a particularly insightful aspect of the post with peers in a Google+Hangout.